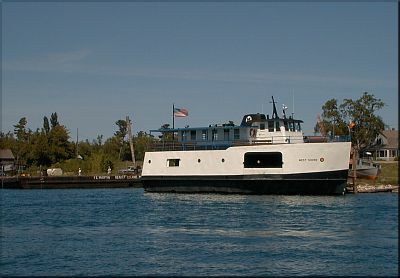 There's a new ferry stationed in Beaver Island's Harbor: Bud Martin's 64' boat, the West Shore. It's a sister ship to the South Shore, both having been owned by the Miller Boat Line of Port Clinton, Ohio. She was built in 1947, has a 30' beam, and is powered with a V-12 Detroit Diesel. She was on the run to South Bass Island in Lake Erie, her entire life; a tourist attraction visited by 15,000 people a day in the summer. 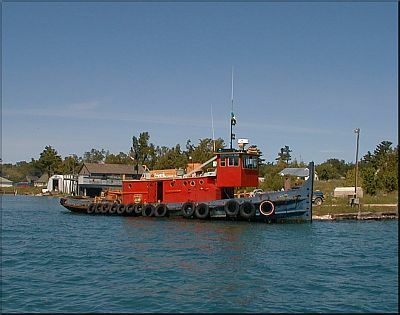 Bud wanted her in order to be able to bring freight to Beaver Island from his dock and warehouse in Manistique, MI. When Bud decided to buy the West Shore, he and two friends, Bob Banville and Denis Glen, drove two cars down to Port Clinton, where they joined up with former Islander Mike Cull, who is experienced in sailing on the Detroit River. They arrived on South Bass Island on a ferry that makes 28 trips a day in season, at 5:30 on Thursday evening. The West Shore was running. Billy Market, Miller's owner, turned out to be that rare phenomenon: a man of his word. They took the boat for a test run, and everything was as he had said. He had gotten such good use out of her by paying close attention to maintenance. After completing the purchase, Bud and his crew drove their three cars on-board, and were ready to depart the next morning. By 8:00 on Friday morning, Bud had his new boat heading for the entrance of the Detroit River. The weather was a little rough -- 5' seas -- but the windshield wipers worked fine to keep the spray clear. They did have to run below and chain down the cars, though. They crossed Lake St. Claire, by supper time, but there were gale warnings up, so they decided to spend the night at the "Bean Dock" under the Blue water Bridge, at the narrowest stretch of the St. Claire River. After 4 to 5 hours of sleep, they were ready to go again at 4:45 the next morning. The wind was down, and conditions looked good, but they had to wait for two incoming and one outgoing large freighter to go first. They were finally underway at 6:45 on a beautiful Saturday. The high point of the trip was seeing the Mackin ac Bridge at 5:15 a.m. on Sunday morning. Seeing her lit up so brightly was a welcome landmark in the early morning. After 28 hours of continuous sailing, the intrepid crew reached their berth at Beaver Island 9:00 a.m. Sunday.